Laptops with Google’s Chrome operating system, an alternative to Windows or Mac, are Chromebooks, and they are selling big. Sales are expected to reach 5.2 million units this year, up 79 percent over last year. We first wrote about these laptops two years ago. The key issue with Chromebooks is that nearly everything happens online. The other advantages are light weight, long battery life and no viruses. Prices start around $200 and battery life runs around three to eleven hours, depending on the model. 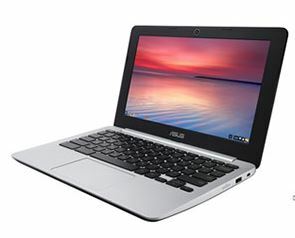 The latest ones are the Asus C200 and the Chromebook 13 from Acer. Because nearly everything they do is online, the programs and services are maintained by Google. They provide the software and every time you start up the Cromebook, Google does a virus check and clean-up if needed; there is no charge for this. People who buy this kind of laptop have limited uses in mind: They’re great for email, web surfing and online apps for word processing, spreadsheets, phone books and other business software. Many people do nothing else on their home computers, so they may as well have a Chromebook for its speed and freedom from infection. If you want to play games – a frequent source of problems– you can download clear, free ones from Google Apps. Don’t use a Chromebook for your main computer if you need Microsoft Word and other offline programs. The newer models have around 16 gigabytes of storage, so you can download a couple of movies or TV shows from the Google Play Store to read and watch on the road. You can increase this storage by plugging in a flash drive.